Mondo has announced a reissue of Danny Elfman’s score to the Tim Burton-directed Batman. In honor of its upcoming 30th anniversary, the 1989 soundtrack will be available on vinyl in both regular and deluxe editions. The deluxe edition—which features an expanded version of the score—is a double LP with one yellow and black swirl vinyl (like Batman) and one purple and green swirl vinyl (like the Joker). It’s limited to 2,000 copies. 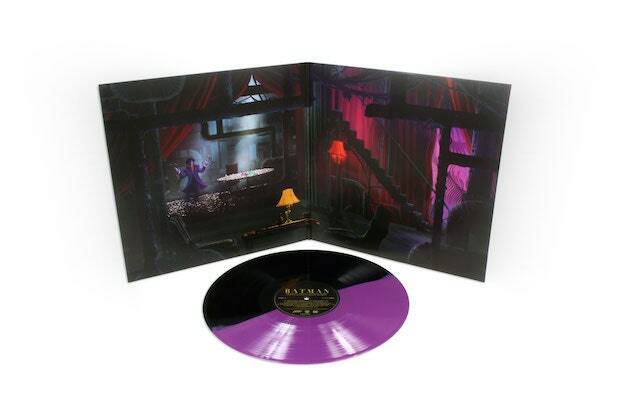 The regular edition features black and purple split-colored vinyl. The Batman vinyl reissue will be available later this month. Funny - never thought I wanted or needed a Batman reissue or expanded edition. Danny Elfman's Batman theme is the perfect theme song for the character and has never been bettered. Kind of similar to John Williams' Superman theme. I'm not a huge score fan, but the main Batman theme is really wonderful. For me, it started a new era of score appreciation. I'm not a huge John Williams fan per se. He's not horrible or anything, just not my style, although some of the Star Wars stuff is memorable. I quite enjoy Hans Zimmer's scores for Hannibal and Gladiator. Ennio Morricone's work on the Sergio Leone movies is fantastic. Easily my favourite movie scores.